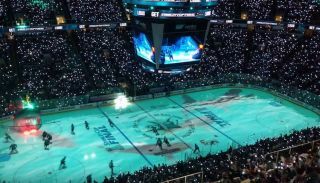 Whether or not you’re a sports fan, it’s hard to argue there’s a better venue for a projection mapping show than an NHL arena: a gigantic, bright-white, 200-by-85-foot canvas in the center of a 20,000-person audience. With the NHL playoffs beginning this week, here are eight of the top pregame projection shows among this year’s contenders (eight, since that’s how many teams will remain in the hunt for the Stanley Cup in two weeks’ time). WARNING: Most of the linked YouTube videos are fan recordings, so beware of erratic volume levels.